Alfa Laval’s P3 range of decanter centrifuges is built for the toughest applications and is specifically developed for solid-liquid separation in the mining and mineral industry. Every detail has been designed to deal with the harsh conditions found in mining, mineral processing and tailings treatment applications. 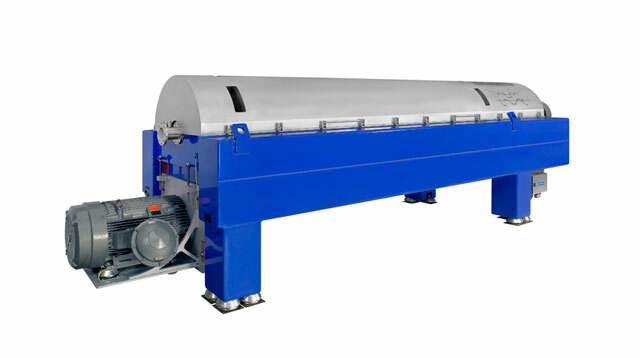 Alfa Laval P3 heavy-duty decanter centrifuges are built with carefully selected components such as Duplex stainless steel, heavy-duty bearings and a stiff box beam frame. All interior parts of a P3 decanter centrifuge exposed to abrasion are protected by replaceable tungsten carbide tiles to eliminate problems. The feed and outlet zones have been designed for smooth acceleration of the solids to minimize wear and secure an efficient separation process. Alfa Laval P3 decanter centrifuges are specifically designed to separate mining and mineral slurries, tailings and sludge into a solid phase and liquid phases. Separation takes place in a horizontal cylindrical bowl equipped with a scroll conveyor. The product is led into the bowl through a stationary inlet tube and is then smoothly accelerated in a full-flow feed zone design. Centrifugal forces of up to 3,500 G make the solids accumulate on the inner surface of the bowl. The conveyor rotates in the same direction as the bowl, but at a different speed. This moves the solids towards the conical end of the bowl. The solids leave the bowl through the solids discharge openings into the casing. Separation takes place throughout the length of the cylindrical part of the bowl, and the clarified liquid leaves the bowl by flowing over adjustable plate dams into the casing.